After the immense enjoyment I got from Gaia Girls – Enter the Earth, I had some high expectations for the second book in the Gaia Girls series Way of Water. I’m happy to say that author Lee Welles delivered yet again! 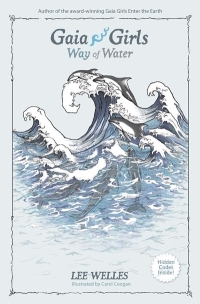 With the first tome based around the element of earth, the second tome is all about water (as the title suggests). Miho’s scientist parents were lost at sea and she now has to move to Japan to live with her uncle. Though she speaks no Japanese and has never met her uncle, she has no other choice but to move in with her only living relative. While visiting the beach house of her grandparents (who have already passed on), Miho meets the already infamous otter, Gaia. Miho is quickly swept up in the excitement of being able to talk to all the creatures of the sea and makes friends with a large group of dolphins. Of course, her adult uncle thinks she is nuts and simply can’t follow orders when he tells her to be home at a certain time and she continues to come home dripping wet. Will Miho and her uncle ever connect? Have you ever traveled across the world in the mouth of a whale? What happens when poachers try to capture some of her dolphin friends? I could answer all of those questions for you, but it would take all the fun out of reading the book yourself. As in the first book, a collection of fun puzzles and intelligent discussion questions follows the story. Welles was also keen enough to add a small Japanese dictionary into the book for the few conversations that occur in the foreign language. Though I neglected to mention them in my last review, the cover and inside art for both books are breathtaking – they really make the story come alive. Book three, Gaia Girls – Air Apparent, is set to be released later this year. Stay tuned to Eco Child’s Play for updates and reviews of the entire Gaia Girls series! Thanks for these great book reviews- I love an adventurous story. Can’t wait to read them. Does anyone know the release date for Air Apparent?